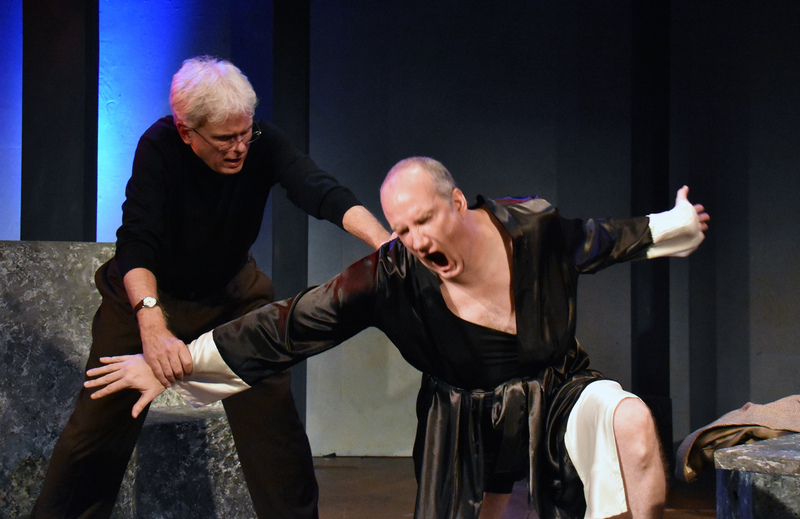 Dave Sikula as Samuel Beckett and Brendan Averett as Andre the Giant in CustomMade Theatre Company’s world premiere production of “Sam and Dede” by Gino Dilorio. Photo Credit: Jay Yamada. CustomMade’s publicty packet for ‘Sam and Dede’ informs us of the following fact: 12-year old Andre the Giant, already over 6 feet tall and 240 pounds, didn’t fit on the school bus. Andre’s neighbor, as repayment of a favor, offered to drive Andre to school in his truck. The neighbor was Samuel Beckett. In the tradition of the greatest two handers, the play is essentially a debate between two characters of profoundly different temperaments and philosophical outlooks on life: the nihilist writer paralyzed by an over active intellect, and the passionate fighter, living enthusiastically in his body. Yet Andre’s giantism makes him unusually sensitive and alert to the vagaries of life, and Beckett’s famous sensitivity to the absurd is engaged by Andre’s unlikely physicality and eccentric show biz career. Dilorio has wisely treated the two characters more as archetypes of Intellect vs Body rather than specific historical personages. As a result, the play works beautifully as an exploration of human types and ideals, even if the audience were entirely unfamiliar with the characters who inspire it. The result is a treat for theatregoers who admire Beckett or Andre the Giant or challenging intellectual plays or all three. And, in the tradition of Beckett, it is also extremely off beat and funny. Dilorio’s insightful understanding of Beckett’s famous ouvre is in evidence throughout, without ever sliding into shallow parody. As Sam, Dave Sikula is simultaneously fiercely intelligent, yet strangely confused and full of gentleness and compassion. This is a characterization that rings true to Beckett. Classical actor Brendan Averett embodies Andre The Giant from the inside out. Although a large man, Averett doesn’t look remarkably like Andre, and he doesn’t need to: he captures the soul. “Sam and Dede or My Dinner with Andre the Giant” is a delicious success! Director Leah S. Abrams and the excellent company have every reason to be proud. “Sam and Dede” plays at CustomMade Theatre Company through March 5, 2016. For further information click here. “Sam and Dede or My Dinner with Andre the Giant” by Dino Dilorio, a world premiere produced by Custommade Theatre Company. Director: Leah Abrams. Set: Erik LaDue. Lighting: Maxx Kurzunski. Sound: Ryan Lee Short. Costumes: Brooke Jennings. Properties: Florence McCafferty. Fight Choreographer: Jon Bailey. Samuel Beckett: Dave Sikula. Andre the Giant: Brendan Averett. Posted in Reviews.Tagged Andre The Giant, Brendan Averett, Custommade Theater Company, Dave Sikula, Leah S. Abrams, My Dinner with Andre The Giant, Sam and Dede, Samuel Beckett.